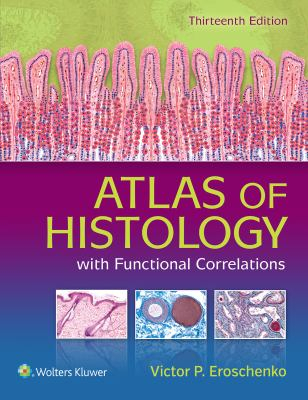 Difiore's Atlas Of Histology : With Functional Correlations - ubiq bookshop: the best place to buy books! Master histology with idealized and actual photomicrography This thirteenth edition of Atlas of Histology with Functional Correlations (formerly diFiore's) provides a rich understanding of the basic histology concepts that medical and allied health students need to know. * Realistic, full-color illustrations as well as actual photomicrographs of histologic structures are complemented by concise discussions of their most important functional correlations. * Illustrated histology images show the idealised view, while photomicrographs provide the actual view to help students hone their skills in identifying structures. * New and improved layout helps students connect the morphology of a structure with its function. Updated and expanded Functional Correlations boxes integrated throughout chapters reflect new scientific information and interpretations. * NEW photomicrographs and electron micrographs provide views of microanatomy as experienced in practice. Bulleted Chapter Summaries distill the most essential knowledge for rapid review. * NEW Additional Histologic Images sections round out each chapter with supplemental photomicrographs and electron micrographs. * NEW Chapter Review Questions allow students to assess their comprehension of each chapter with 375 questions and answers in the book and 250 more online in an Interactive Question Bank.